How Can I Get A Larceny Case Dismissed? Larceny cases fall into two general categories in Massachusetts. Larceny under two hundred fifty dollars is a misdemeanor. Larceny over two hundred fifty dollars is a felony. The former is punishable by up to one year in the county house of corrections and the latter by up to five years in state prison. 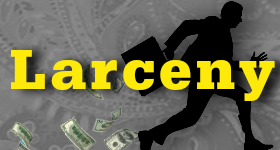 The felony version of larceny is often charged in district courts in Massachusetts meaning that the prosecution is not seeking a state prison sentence. When larceny cases involve disputes over money the person accused is often surprised at how the matter can be charged criminally. In this situation people call will me and ask “how can I get a larceny case dismissed?”. This article examines one of these cases. Larceny complaints can be brought be civilians as well as the police and district attorneys. It is not uncommon to see a larceny case brought criminally when in fact the matter is a civil one that should never be prosecuted. The “victim” in these cases wants money quickly. Maybe this person wants to avoid the cost of bringing a civil suit. Or perhaps this person wants to bully the accused through a criminal action in order to get money right away. Cases like this require the skill of an experience lawyer who can quickly assess what is happening and make sure the judge and district attorney get what is going on. I recently had one of these cases in a court in the south shore. The defendant and the victim had entered into a contract for construction work. The victim gave our client a deposit. Our client then performed the work that was contracted for. Our client then asked for the balance of his payment. The victim refused to give it to him. Instead, the victim filed an application for a larceny complaint. Surprisingly, the complaint issued. Initially the district attorney’s office was intent on prosecuting the case. We subsequently brought several matters to their attention that made them rethink their position. 1) there was a pending civil matter alleging the same conduct; 2) we were able to bring in the contract; 3) we were able to produce evidence that demonstrated that the work had been completed by our client. We then located and contacted the victim’s civil attorney who was unaware of the existence of the criminal complaint. We brought all of this to the attention of the judge as well. The judge permitted us to waive my client’s presence in court meaning that he would not suffer the inconvenience of coming into court as do most defendants in criminal cases. The judge also strongly suggested to the district attorney’s office that they take a good look at this case to determine whether the prosecution should continue. Ultimately, the case was dismissed. Larceny cases and many other types of criminal cases are subject to dismissal through a variety of mechanisms. You can help your cause by hiring the right criminal defense lawyer to represent you. The Law Offices of Stephen Neyman, P.C. has nearly three decades of experience defending the accused. Call us at 617-263-6800 or send us an email. We know that we can help you.